The play will be performed in the Brady Educational Center (BEC), on the campus of the University of Saint Thomas (UST), Saint Paul. The BEC is labeled below on this image from a UST campus map. If you booked tickets beforehand, you may enter the theatre and find a seat immediately once the doors open. If you did not book tickets beforehand, please see an usher about being added to the waiting list. Five minutes before the start of the show, seats not taken by ticket holders will be released. Entrance to the BEC auditorium is from the north side of the east wing of the building. Parking is free during showtimes anywhere within the black box shown on the map. Street parking is also available in several directions, but some streets are subject to local permit restrictions. 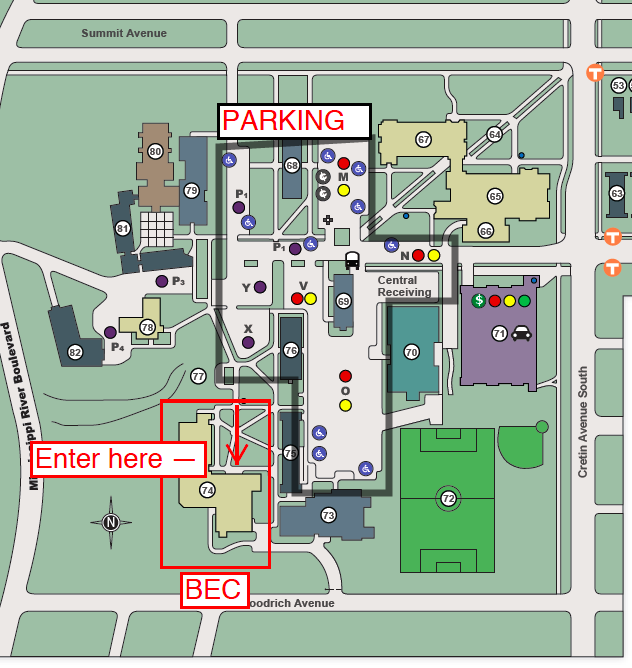 For an hourly fee, you may also use the parking garage (Purple #71 on map), near the corner of Grand and Cretin Ave.
For a full UST campus map, click here. For Google Maps directions, click here.